Born in Valencia, she studied guitar and singing in the Conservatorio Profesional de Música of that city. After being awarded, in June 2002, a Second Prize upon completion of her Bachelor’s Degree in singing, she proceeds her studies in the Conservatorio Superior de Música “Joaquín Rodrigo” of Valencia in the class of the soprano Gloria Fabuel. She performed at the Palau de la Música de Valencia in the project “Me llamo Mozart”, singing W.A. Mozart arias from “The Magic Flute” (Queen of the Night and Papagena), “The Marriage of Figaro” (Susanna) and “Don Giovanni” (Zerlina). She also performed “Amahl and the Night Visitors” by G.C. Menotti, and “Suor Angelica” by G. Puccini, in the role of Suor Genovieffa. In 2006 Beatriz obtained the third prize in the Chamber Music category, the Audience Award, and the Best Valencian Performer Award at the V “Luys Milán” International Guitar Competition of Vila de l’Olleria. 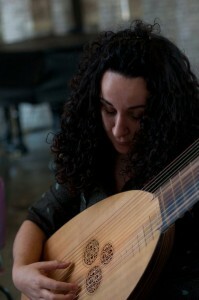 After being granted a scholarship by the Institut Valencià de la Música (Generalitat Valenciana), she moves to The Hague to further her studies at the Royal Conservatory, where she has completed a Master’s Degree in Early Music Singing, specializing in early Baroque Italian music and reviving the original performance practice of self-accompaniment with the theorbo. She has studied singing with Rita Dams, Michael Chance, Jill Feldman and Peter Kooij, and theorbo with Mike Fentross and Joachim Held. She has attended masterclasses with renowned teachers such as Robert Expert, Marta Almajano, Cristina Miatello, Evelyn Tubb, Lambert Climent, Stephen Van Dyck, Johannette Zomer, Fred Jacobs and Margreet Honig. While at the Royal Conservatory of The Hague she has worked with Early Music specialists such as Fabio Bonizzoni (La Risonanza), Charles Toet (Concerto Palatino), Emilio Moreno (El Concierto Español) and Christina Pluhar (L’Arpeggiata). She also performed the main role in the Intermedi per La Pellegrina conducted by Mike Fentross, where she sung whilst accompanying herself on the theorbo. Upon becoming a specialist in the field of Early Music, she has performed around Europe with diverse ensembles such as Las Esferas, Musica Poetica, La Academia de los Nocturnos, Ribattuta Ensemble, Le Jardin Secret, Harmonia del Parnàs, Os Orphicum, Collegium Musicum Den Haag, Música Temprana, etc., in festivals such as XVI Festival de Música Antigua de Peñiscola (Spain), XII Festival de Música Antiga: Música, Història i Art in Valencia, Fringe Festival Oude Muziek in Utrecht, Festival Classique in The Hague, V Festiwal Twórczosci Religijnej (Poland), Dag Oude Muziek in Bilzen (Belgium), XXV Edizione Pievi & Castelli in Musica (Italy) and Cyclus Koncertu Staré Hudby Brno 2012, among others.